Triggered by massive losses in HSI (-2.2%), STI (-2%) and SHCOMP (-1.7%), Asian markets were in red on renewed fears of a hard landing in China’s economy after the country cuts its 2012 GDP growth target to an 8-year low of 7.5%. Sentiment was also dampened by concerns over a Greek default ahead of its debt-swap deal on 8 March and a sluggish Feb euro-zone PMI of 49.3 (consensus: 49.7; Jan:50.4). Tracking the regional slump, KLCI declined as much as 8 points intraday before rebounding to end +0.7-point at 1589.9, spurred by last minute buying of selected bluechips. After hitting 1594.7 on 5 March (within our envisaged immediate 1590-1600 resistance zones), broader market sentiment has turned cautious, reflected by the weakening gainers/losers ratios, declining trading volume and the flattening RSI and slow stochastic indicators. On top of that, the overnight plunge on Wall St and Europe markets are likely to further dampen investors’ sentiment and disrupt the upside momentum for the next few days. 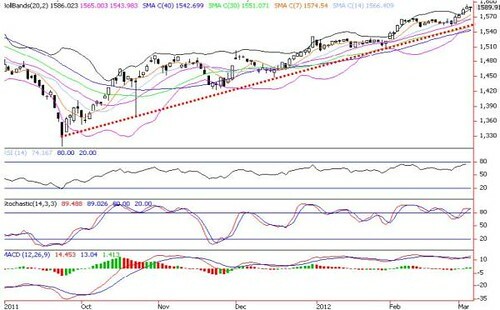 Immediate supports are 1574 (7-d SMA) and 1566 (14-d SMA), followed by crucial uptrend line near 1551 (30-d SMA). (mid Bollinger band).